The 24th annual amfAR Gala Cannes raised more than $20 million last week in support of amfAR, The Foundation for AIDS Research, and its pursuit of a cure for HIV/AIDS. Event Chairs in attendance included Jessica Chastain, Dustin and Lisa Hoffman, Nicole Kidman, Diane Kruger, Eva Longoria, Carine Roitfeld, Harvey Weinstein, amfAR Chairman of the Board Kenneth Cole, amfAR Global Fundraising Chairman Milutin Gatsby, Len Blavatnik, and amfAR Trustee Vincent Roberti. Other guests in attendance included Leonardo DiCaprio, Will Smith, Diana Ross, Nicki Minaj, David Beckham, Dionne Warwick, Uma Thurman, Adrien Brody, Christoph Waltz, Tobey Maguire, Joe Jonas, Rita Ora, Chris Tucker, Tracee Ellis Ross, Jean Paul Gaultier, Irina Shayk, Karolína Kurková, Bella Hadid, Joan Smalls, Coco Rocha, Natasha Poly, Lewis Hamilton, Kate Upton, Julian Lennon, Stacy Martin, Hailey Baldwin, Petra Nemcova, Dean and Dan Caten, Georgia Fowler, Winnie Harlow, Jessica Hart, Valery Kaufman, Doutzen Kroes, Lara Lieto, Maryna Linchuk, Angela Lindvall, Sasha Luss, Zuhair Murad, Philipp Plein, Sofia Richie, Olivier Rousteing, Jeremy Scott, Remo Ruffini, Lara Stone, Jasmine Tookes, and Timothy White, among others. Event Chair Eva Longoria thanked the event’s sponsors, and then introduced amfAR Chairman of the Board Kenneth Cole, who stressed that “ending AIDS is not a fantasy, it is a goal within our reach,” and discussed amfAR’s Countdown to a Cure initiative, which in less than three years has awarded grants totaling close to $40 million to support HIV cure-focused research conducted by more than 150 scientists working at 55 institutions in 10 countries around the world. Cole then introduced fellow amfAR Gala Cannes Event Chair and longtime amfAR supporter Harvey Weinstein, who continued to stress the importance of raising funds for research. Rita Ora debuted “Your Song,” the first single to be released from her untitled, forthcoming album, which she co-wrote with Ed Sheeran. 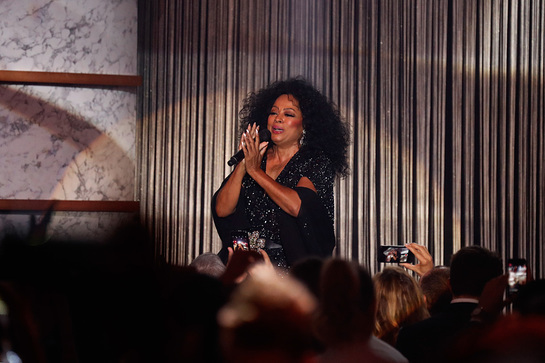 Another stunning feature of the evening was the Golden Age of Hollywood Collection fashion show curated by longtime amfAR supporter Carine Roitfeld. The dazzling collection featured one-of-a-kind looks from the world’s most celebrated fashion houses. Participating designers included Alexander McQueen, Balmain, Chanel, Dior, DSQUARED2, Elie Saab, Fendi, Giambattista Valli, Givenchy, Gucci, Kenneth Cole, Lanvin, Louis Vuitton, Marc Jacobs, Marchesa, Moncler, Oscar de la Renta, Philipp Plein, Prada, Ralph Lauren, Redemption, Saint Laurent, Tom Ford, Versace, and more. Thirty of the world’s top models participated in the runway presentation, including Bella Hadid, Irina Shayk, Karolína Kurková, Hailey Baldwin, Barbara Palvin, Jasmine Tookes, and Natasha Poly, among others. The Golden Age of Hollywood Collection was subsequently auctioned off in its entirety for over $3 million. Guests enjoyed bidding on an array of exclusive items and experiences during the live auction, conducted by auctioneers Simon de Pury and Sandra Nedvetskaia. The undisputed highlight of the auction was when Will Smith and Jessica Chastain took the stage to introduce a set of ten images featuring stars such as Rita Haywork, Bette Davis, Joan Crawford, Katharine Hepburn, Clark Gable, and more by George Hurrell, the photographer who invented the Hollywood glamour portrait. Smith played the role of auctioneer, and after convincing other celebrities in the room such as Uma Thurman, Tobey Maguire, and Chris Tucker to take the stage with him, was able to sell the lot, and the winner also took to the stage for a photograph with the stars. Actor Chris Tucker introduced a 1958 Jaguar XK150, arguably the finest post-war production sports car ever produced. Legendary football star David Beckham took the stage to introduce a once-in-a-lifetime opportunity, a chance for the winning bidder and ten friends to join David Beckham in an exceptional 90-minute football match in Paris, followed by dinner and drinks with Beckham. A painted 1977 Chevy Van titled Ice Cream, a work by Street Art movement pioneer Richard Hambleton. Inspired by his large-scale artworks that were installed in Rio de Janeiro during the Olympic Games, showcasing the “perfect motion” of an athlete’s skill, artist JR created GIANTS, The Diver, Sculpture of Cleuson LIMA DO ROSARIO for the amfAR Gala Cannes. The massive sculpture of a diver was on display at the event at the base of the allée of the Hôtel du Cap, ready to plunge into the Mediterranean. Ape Suzette, a sculpture of highly polished bronze featuring a comical giant ape by The Haas Brothers, twins Nikolai and Simon. A one-week trip for 30 guests aboard the superyacht Serenity. A magnificent seven-night stay for 60 people at the Finolhu Resort in the Maldives, with VIP access to the newly opened 1OAK Beach Club. Christoph Waltz introduced an opportunity for the lucky winner travel with Johan Ernst Nilson, one the world’s leading explorers, to meet His Holiness the Dalai Lama along a five-day trek in the Indian Himalayas. The Egg Number 1, Versailles, a work by French artist and interior designer Jonathan Loubens. Coco Rocha introduced a one-of-a-kind cognac celebrating eight generations of Hennessy Master Blenders from the same family. Hennessy•8 is a unique blend of eight rare eaux-de-vie created by Yann Fillioux and his nephew and appointed successor Renaud Fillioux de Gironde. Showcased by the acclaimed designer Arik Lévy in a Baccarat Crystal carafe enclosed in a precious chest made from wood from Hennessy Barrels, the masterpiece and its history were presented with Renaud and Arik in the audience. A one-of-a-kind sculpture created specifically for the amfAR Gala Cannes by Alec Monopoly, the alias of an unidentified graffiti artist, titled Director Monopoly. This work, the largest sculpture Alec has created to date, represents the constant battle between business and creativity that takes place in Hollywood and is an ode to the larger than life nature of big budget blockbuster movies and capitalism that currently dominate the film industry. Compassion, a 3D lenticular lightbox by Chris Levine of his 2015 photograph of the 14th Dalai Lama, in which His Holiness posed for a formal portrait in aid of earthquake victims in Nepal. Karolína Kurková helped introduce Big Ego, a work by John Giorno. Dancing Fairy, one of the creations of acclaimed architect and designer Vasily Klyukin’s Fairy Fame series. Harry Winston and Bold Films were the Presenting Sponsors of the amfAR Gala Cannes. Moët Hennessy, Persol, and Renault were the event’s Signature Sponsors. Guests were welcomed into a Hennessy “Secret Room” to discover Hennessy X.O and greeted by servers with coupes of Moët & Chandon Impérial and the special edition Belvedere amfAR Martini. Guests enjoyed wines and spirits from the Moët Hennessy portfolio throughout the entire evening, including the After Party, which featured a golden Moët & Chandon bar playing off the Golden Age of Hollywood theme. amfAR debuted its new fragrance, GALA for Men and Women, at the event. After the amfAR Gala Cannes dinner, guests were invited to the exclusive After Party, presented by Moncler. amfAR’s annual amfAR Gala Cannes events have been important and successful fundraising events for the Foundation for over two decades, generating more than $200 million for amfAR’s life-saving research programs and keeping the fight against AIDS in the global media spotlight. amfAR continues to fund HIV/AIDS researchers worldwide, and works to translate their research into effective policy, prevention, and treatment education programs around the globe. Additionally, amfAR recently launched the Countdown to a Cure for AIDS Initiative, aimed at developing the scientific basis of a cure 2020. The Countdown to a Cure is designed to intensify amfAR’s cure-focused HIV research program with plans to strategically invest a multiyear total of $100 million. The amfAR Institute for HIV Cure Research, an innovative collaborative enterprise based at the University of California, San Francisco (UCSF), is the cornerstone of the Countdown to a Cure.